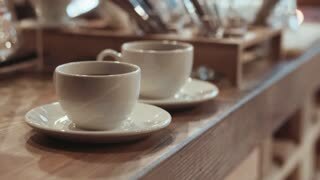 Two glittering white cups with coffee on a soft oak counter waiting for the customers. Morning routine. Morning traditions. Cafe settings. Baristas instruments on the background. Side view of young casual couple standing in flower shop and holding big bouquet together on background of counter with cashier. 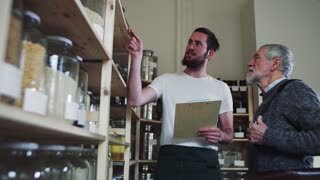 Man and woman wearing striped aprons standing at counter in floral shop and talking to female customer buying flowers. Young woman is talking on mobile phone while sitting at counter in bar with cocktail. Customers moving and talking in background. Modern communication in pub concept.